AMMONNEWS - His Majesty King Abdullah II on Sunday met dignitaries and tribal figures from the northern, central and southern Badia for a discussion on an array of national issues and current affairs. During the meeting at the Royal Hashemite Court, King Abdullah paid tribute to the servicemen who made the ultimate sacrifice while defending the nation, saying: "We are in constant contact with the families of martyrs to check on their conditions and their future." "I assure everyone that we are capable of protecting our borders from inside and from outside, and I have full confidence in our military and security institutions," King Abdullah said. "During my visits to those injured in the recent events or to military units, I have seen them fully prepared to rise up to the duty again and give their lives to protect Jordan," the King told the audience. 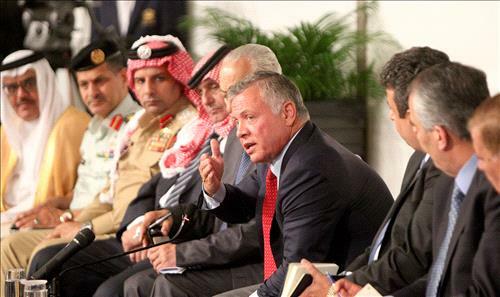 King Abdullah said that the doors of the Royal Hashemite Court are open to all Jordanians. "This is the communication that we want from the Royal Court and all our institutions to listen to the needs of the citizens and to take appropriate measures," he said. His Majesty underlined the need to respect the rule of law and apply it to everyone firmly and transparently, pointing out that some commit violations of the law in Jordan; something they don't do when they are abroad. He called for an all-encompassing national dialogue on corruption. When addressing corruption, character assassination and chaos must be shunned because doing otherwise would adversely impact Jordan's reputation. Turning to regional issues and particularly the Palestinian issue and Jerusalem, His Majesty the King affirmed that Jordan has not and will not change its positions towards the Palestinian cause and Jerusalem. "We Jordanians, when we are convinced of something, we never change our positions," he said. He added: "As for the protection of Jerusalem and the future of Palestine, I hear rumors and I do not know where they are coming from, but we as Jordanians know what is required. For us, the future of Jordan is the most important thing, and also how to help our brothers in the West Bank and Jerusalem." King Abdullah reiterated Jordan's firm stance on the Palestinian issue, which is based on the need to achieve the just demands of the Palestinian people and the establishment of an independent Palestinian state with East Jerusalem as its capital according to the two-state solution.